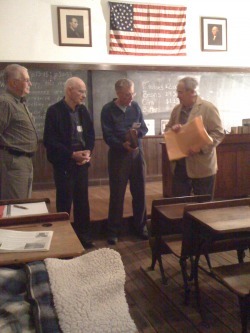 At the November 19th meeting, Green Historical Society member Jerry Miller presented representatives from the Lake Township Historical Society with a Day Book circa 1855 from a store called P. Shollenberger located in downtown Hartville. Mr. Miller found the hardbound book at a sale years earlier. Mr. Miller also presented the LTHS with a photocopy of the Day Book for their use as a reference. Pictured here (left to right) are Dennis Benson, Richard Werstler, and Ron Myers, LTHS, and Jerry Miller, GHS.